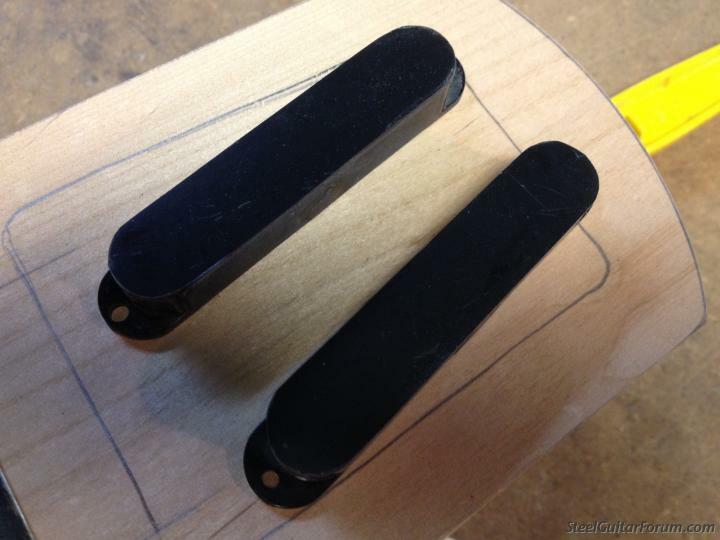 Fender stringmaster pick up covers for the T8. ???? Topic: Fender stringmaster pick up covers for the T8. ???? Hello. everyone just wanted to know, can any one supply me with the above items. 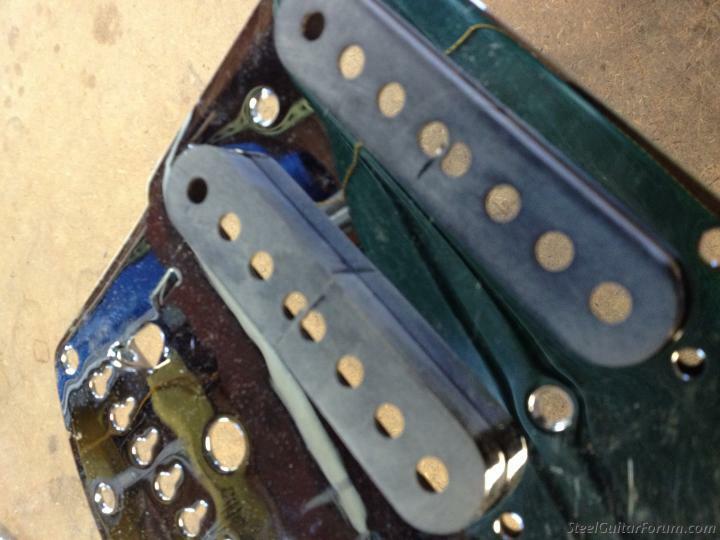 There are two different styles of pickup covers. On the early Stringmasters, the pickup covers screwed down. The later pickup covers pivoted on the bridge rod so you could access the blend control. They are not available new for love nor money. I bought an old pickup to get one... over $100. At least the pickup's good! 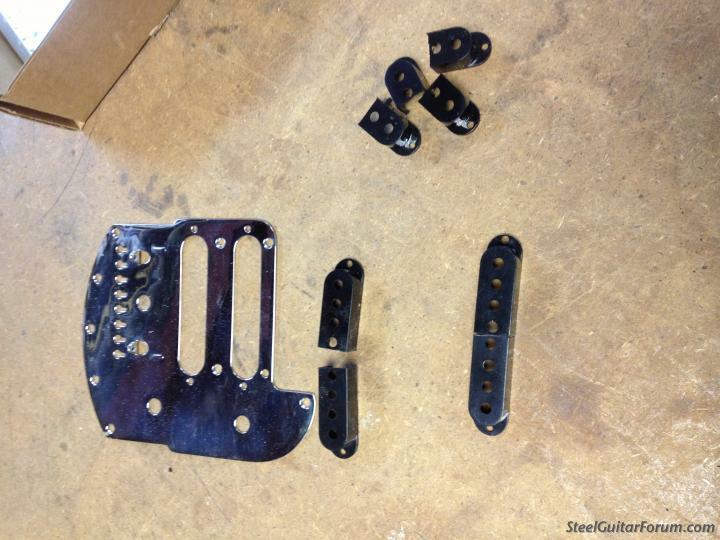 You can make one from two Mustang pickup covers, or use Strat pickup covers and plug/cover the holes. You need a bandsaw and a good belt-sander from what I've seen... cut them in two, then join the halves (don't cut them right in the middle!) using super glue. This is one of those Stringmaster items we're all waiting for FMIC/aftermarket to fix us up with... heck, you can get the pickups, just not the covers! Erv, you may be referring to the bridge covers... I'm guessing. Just the pickups from Lollar and Duncan, like Stephen said, no covers. I've been successful with the method described above with the Mustang covers. There's also a guy on eBay who seems to have an endless stream of Stringmasters that he parts-out. As the market gets saturated, his pickup prices are coming down. Sorry, my confusion about the bridge covers. But there are also two different kinds of pickup covers. The early Stringmasters had chrome pickup covers, the later, plastic. So, maybe I'm half right. Yes even less to get a set over here in the UK, thanks to you all for your info. It always irritates me when folks remove & lose those covers. I suppose they get tossed out in later years when folks find them & don't know what they are. The Mustang is in reissue... those covers should be easy to get. That's why I suggested them as the starting point for crafting your own 8string covers... Mike Stevens told me that's how he makes his, for the Guit-Steel ("No Stringmasters were harmed" etc). If not pup covers,at least ribbon to cover the wound copper wire.I'm thinking about using red ribbon. These are some I made from 6 string covers I cut and glued together. The problem is that lollar and Duncan flatware is bigger then the originals so some file or scraping is necessary.